Most shoes lovers always face a dilemma of sorting shoes. Keep it or Throw it away? Solid Wood Cabinet and Storage For Your Entryway is an efficient way to keep your shoes stored in a single location and make your house tidy. Many people like to have plastic shoe shelf as it is extraordinarily economic. Yet, the lifespan of a plastic shelf is usually around 3 years, it is even shorter when it comes to the weather in Hong Kong – wet and hot (Imagine that your cabinet has to accommodate your soaked, stinking and ashy shoes all the day…). In this regard, having a shoe cabinet in good quality is more cost effective, turmoil-free as well as saving you more space! The solid oak used for Snyder shoe cabinet is all imported from North America. It has 5 tiers which can store more than 15 paris of shoes of various kinds and sizes. The light oak colour of the shelf conveys a homey feeling in your house while you can also regard this cabinet as your console table. Surely you can put keys, coins, accessories or even a table lamp on the board surface near the door. Check out Solid Wood Cabinet and Storage for more product information. 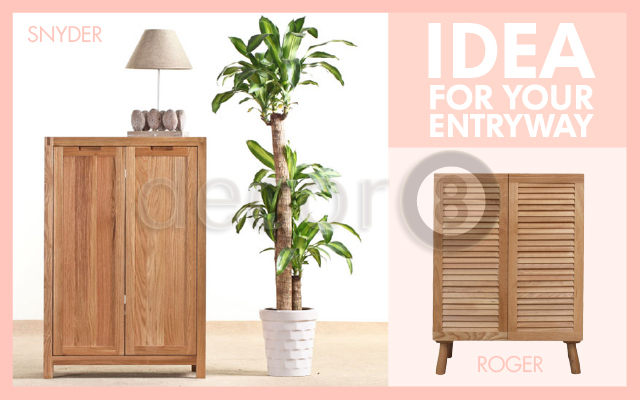 Roger shoe shelf is slightly taller than Snyder, and the major difference with Snyder Shelf is the Persian blind design and the cabinet legs. Take a deep look on the shelf, the Persian design allows a better air flow and therefore do not worry about being overwhelmed by the stinky smell when you open the cabinet. Similarly, it has 5 tiers but you can remove the wooden plates by yourself to create more leeway flexibly, in case if you want to store some larger items inside the cabinet. Addition to placing it in the entryway, Roger storage unit is also perfect for living rooms and dining rooms. Please visit Solid Wood Cabinet and Storage for more information. This entry was posted in Cabinets, Drawers, Wardrobes, Console Storage Units and Side Cabinets, Multi-Functional Storage, Shelving Systems and tagged affordable storage, Cabinet and Storage Hong Kong, popular storage unit, Shoes Cabinet, solid wood, Storage Hong Kong, Storage Unit, wood storage.